2017 Cremes Langhe D.O.P. – Angelo Gaja - On Offer here | Saporidoc UK. Cremes from the famous king of Piemonte wines Angelo Gaja. A producer that is known all over the world for his wines, that all have a great structure, complexity and the unique Gaja style elegance. This deep ruby red full body wine is a blend of the local Dolcetto grape and Pinot Noir resulting in a balanced, elegant and pleasant wine. 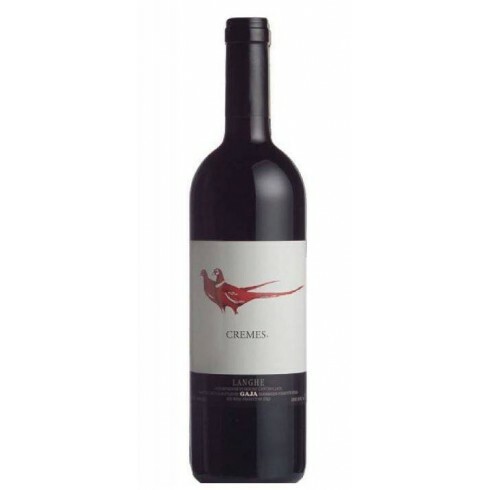 Pairs with Pasta dishes, Roast meat or Medium-aged cheeses, Serve at 16-18 C.
The Dolcetto and Pinot Noir vines for the Cremes red wine grow in Gaja’s vineyards situated in the Langa region in Piedmont. The grapes were carefully hand-picked, sorted, and destemmed. The grapes were fermented and macerated separately in steel vats at controlled temperature. At the end of malolactic fermentation, the wines were assembled and matured for 6 months in large oak barrels.